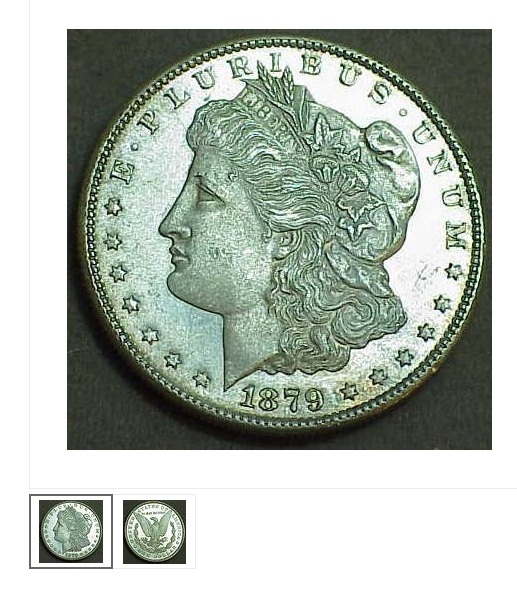 Take a good look at this coin lot by Liberty Shops Auctions. The photo is sharp in good lighting and the coin looks uncirculated with a probable strong cartwheel. Until the coin arrives at your home, and you view the lot in person. There may be no sheen at all. Thankfully, auctioneer Sean Cook has provided a note that the coin has been dipped. He uses the numismatic term “details” to let the buyer know that the coin has to be “net” graded as it won’t slab by a top company such as PCGS or NGC. Sometimes dealers or hobbyists use dipping solutions like E-Z-Est (Jeweluster) Coin Cleaner to remove a layer of grime or black toning. If done quickly and expertly, the coin’s luster won’t be stripped. Dipping products differ from MS70 Coin Cleaner which doesn’t remove a layer of molecular metal if used too long or improperly. A dip can do that, which often leaves coins with a “white” lackluster sheen in the short term and then a coppery toned look over time. If you view the metal with a loop, and slant the coin toward the light, you should see minuscule poking not unlike that of a lemon peel. These are fairly easy to spot. The one that Sean Cook identifies for his viewers would pass as pristine. Thankfully, he runs an honest shop and wants his customers to return and bid in future auctions. So he identifies the dipping. 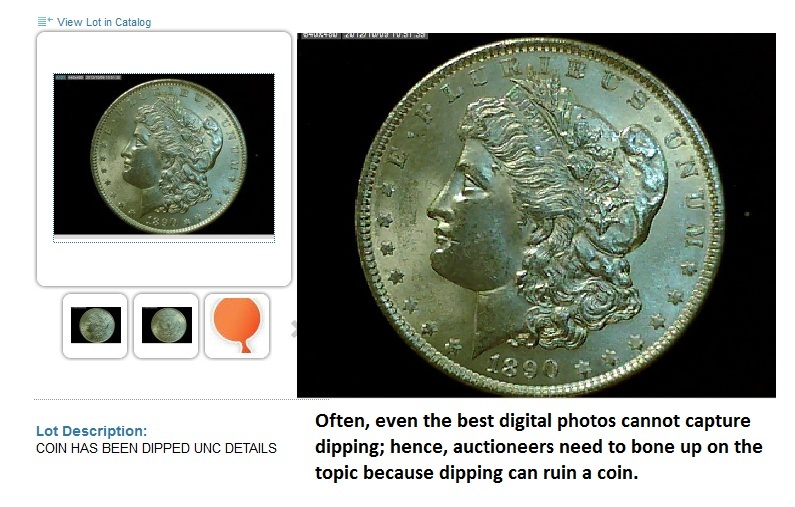 Unfortunately, light boxes and automatic digital cameras (especially with flash) can create a false cartwheel effect, which makes buying coins difficult on Proxibid if an auctioneer claims not to know numismatics but nonetheless holds regularly coin auctions. Those folks have a duty to know coin conditions as a good portion of their consignments are probably dipped. Unfortunately, many collections–especially estate ones assembled in the 1980s or earlier–are dipped because hobbyists disliked toning of any sort, even rainbow tones that now bring premiums. Those dipped coins usually have that coppery look. We recommend reading Proxiblog, Coin Update News, Coin World and other hobbyist publications to sharpen your skills not only with dipping but also with artificial color, alterations and counterfeits. It just comes with the numismatic terrain. This entry was posted in Articles, News and tagged American Numismatic Association, Auctioneers, AuctionZip, Best Practices, Coin Auction, iCollector, National Auctioneer Association, Proxibid, Proxiblog. Bookmark the permalink.